Obituary for Michael William Hackman | Westlock Funeral Home & Crematorium Ltd. 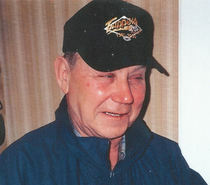 It is with great sadness the family announces the passing of Michael William Hackman of Westlock. Michael is survived by his loving friend of 26 years Janice; niece Karen; nephews Jerry and Murry (Diana); children Tessa, Natasha and Sophie; step daughter Jody and Cheryl (Keith); step grandchildren Lukas and Jaelyn. Michael was predeceased by his parents Demetro and Annie (Semenchuk) sister Mary and brother in law John. Michael was born and raised on the family farm northeast of Jarvie. He had a long-life passion for farming and curling. Michael always had time for a chat, story time with a warm smile, and a chuckle. A Memorial Service will be held on Saturday Feb 16th, 2019 at 2;00 PM at the Westlock Memorial Hall. Arrangements taken care of by Westlock Funeral home and Crematorium Ltd.